Worcester, Mass., June 6, 2018—Location, Inc., a leading provider of location-based analytics, joined with city officials and community members to celebrate the opening of its new headquarters at the newly-renovated Mercantile Center in downtown Worcester, MA. Over 40 guests were in attendance, including the City Manager of Worcester, Edward M. Augustus Jr., and members of the Worcester Regional Chamber of Commerce. Overlooking the Worcester Common, Location, Inc.’s Class A office space enables the company to accommodate its growing staff while offering easy access to transportation, dining, and entertainment amenities. This is a top priority for Location, Inc., which was honored by the Worcester Business Journal as one of the top companies for employee rewards and recognition in 2015. “Our building at 120 Front Street is a strong strategic site for innovative businesses like Location, Inc. that are seeking a central vantage point in an urban setting close to a transportation hub and surrounded by neighborhood amenities. We are excited to welcome Location, Inc. and their employees to our downtown community,” said Chip Norton, president of Franklin Realty Advisors, developers of Mercantile Center, when the company announced the move in November 2017. 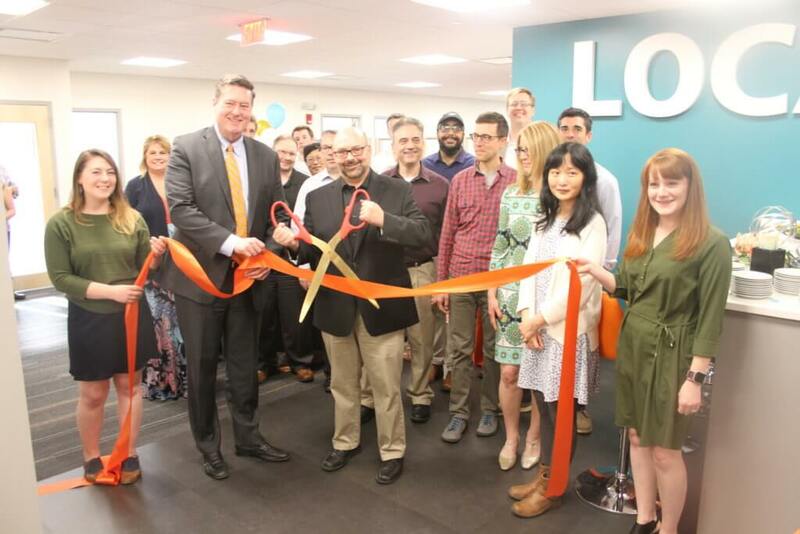 Edward M. Augustus Jr., the City Manager of Worcester, MA, and Dr. Andrew Schiller, CEO and founder of Location, Inc., are flanked by employees at the company’s ribbon cutting ceremony at Mercantile Center on May 23rd. The office move marks the midway point in a busy year for Location, Inc. In addition to launching an enterprise data and analytics catalog for insurers, real estate investors, and businesses, Location, Inc. announced that its WaterRisk™ and FireRisk™ products, the insurance industry’s first non-weather-related risk solutions, will be offered by CoreLogic. For more information about Location, Inc. or the new office grand opening, please contact marketing@locationinc.com.